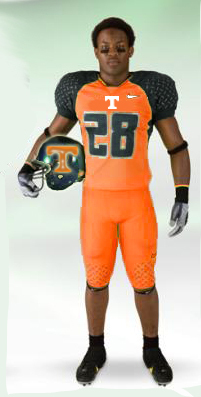 The Vols’ new uniforms? Go ugly or go home! Post-season note: This post could not have been more wrong. On every level it misses the mark. The First Week of College Football Is it just me or does everyone else think that Sports Center is exponentially more interesting now that they have news and highlights from actually football games. In my opinion, slam dunks, homeruns and the latest grunt from your choice of tennis star makes for such mediocre television. But, I come to praise football, not bury the lesser sports. Here’s what I observed. The New Uniforms –From the buzz I’ve read and heard since this holiday weekend’s slate of college football games, I may be the only guy in the country who actually liked the new uniforms. I’m not a fan of holding on to tradition for tradition’s stake. The world is in a constant state of change. College football needs to change with it. Sure Georgia didn’t fare too well with their shockingly red uniforms and space age helmets, but the new unis were not to blame. The problem was Boise State in their cool new duds played flawless. And, Maryland? Nice. I liked the NFL Europe-esque design. I hope these new uniforms keep coming. Someone call Dooley at Tennessee and get him on the road to updating my team’s God-awful, community service orange attire. Wisconsin – Watch out for the Badgers. Sure, they played an over-matched opponent, but I still expected them to have some hiccups with a new (but talented) QB at the helm. Instead, they played effortlessly. This does not bode well for the rest of the Big 10 (which confusingly has 12 teams). My prediction. They’ll be in a position to play in the BCS title game by season’s end. Georgia – If I were a Georgia fan, I’d be paying attention to the mid-major games this year, because a coach from one of those teams is going to be your man next year, or you might be able to get Al Golden from Miami. The point is Richt will most likely be an ESPN analyst in 2012. Miami – And speaking of Al Golden. The man got completely hosed by The U’s administration. They hired him without telling him they were under NCAA investigation, a move that speaks volumes about the school’s total embrace of corruption and lack of decency. The NCAA won’t kill the program because there’s too much money at stake, but I can see everyone from Donna Shalala to the assistant AD’s executive assistant getting canned at the NCAA’s nudging. Florida State – Sorry Seminole fans, but Florida State may be the most overrated team in the country right now. The latest poll has them at number five, and I just don’t think they’ve made that much of a recovery from Bowden’s lackluster recruiting results the last few years of his regime. The Polls – I don’t like preseason polls because they are based on nothing but the so-called experts’ ethereal, mystical knowledge of things to come. With the season upon us, I think we can get a better gauge of the college football landscape. Here’s my far from expert opinion on the top 10 after week one. LSU – But it won’t last. Wisconsin – This is the team that impressed me most. The offense is clicking and the defense is scary good. Oklahoma – The Big 12 (which only has 9.5 teams) is in disarray this year. The Sooners stand to benefit the most from all the turmoil. Boise State – Kellen Moore should win the Heisman, but he probably won’t. Why? Rumor has it he’ll be on the cover of Sports Illustrated this week. Damn you SI! Stanford – The LSU game unveiled some major weaknesses in Oregon’s defense and running game. In turn, they exposed the PAC 12’s weakness, their teams. Stanford has Luck. Luck has the talent to carry the team through the less than stellar conference. Alabama – They have a new quarterback, but in an Alabama system, QB’s are required to play smart not lights out. As long as the guy behind center doesn’t make a lot of mistakes, the Tide will stay in the hunt. Texas A&M – Never discount a team with talent and a chip on their shoulder. The coaching staff has an “us against the world” card to play all year. That kind of thing works in college football. South Carolina – I think Spurrier is inside Garcia’s head. He knows just how to pull the kid’s strings, and turn him into a spirited leader. The Gamecocks are not a team you want on your schedule this year, and it’s not just because of their semi-phallic name. They have an offense that can score at will. Virginia Tech – The ACC doesn’t have much to talk about beyond Maryland’s new uniforms. The Hokies have the potential to dominate the conference. Houston – I know. I know. Houston? But, they beat a major conference (albeit weak conference) opponent, and they have a cake schedule ahead of them. They could be this year’s TCU and bring in an undefeated record come bowl season. This entry was posted in News I Find Interesting and tagged ap top ten, college football. new uniforms in college football, number one team in college football. Bookmark the permalink.